My friend Hayley and I are doing a knit-along together. This has been in the works since the beginning of summer, but since knitting usually takes a back seat in the warmer weather (well, not with me) the start date for the KAL kept getting pushed back. We were at a Friday knit night when Hayley confessed that she has never knit a sweater before. I was thumbing through a knitting magazine when a cardigan pattern caught my eye and I exclaimed my love for it. Hayley had glanced over and said that the cardigan was one that she liked too. I quickly looked over the pattern and discovered that it was a fairly simple, basic, and easy enough pattern for a beginner to tackle. The wheels were turning. I get pretty excited when knitters of any level challenge themselves and try knitting something that is out of their comfort level. Whether that be an accessory knitter (you know, the knitter that knits nothing but hats, mitts, scarves...accessories) tries her hand at knitting a sweater (no pun intended), or a sweaters-only knitter finally gives socks a go. Basically taking their knitting to a different stage. As someone who used to be scared shitless at the idea of knitting a sweater...that is, until I finally did it and realized that it wasn't scary at all, just time consuming...I saw this as my chance to help another knitter get to the next level. So I suggested we do a knit-along together and knit a cardigan together. Hayley was totally game. Yay! We planned on knitting the Lodi Cardigan together. 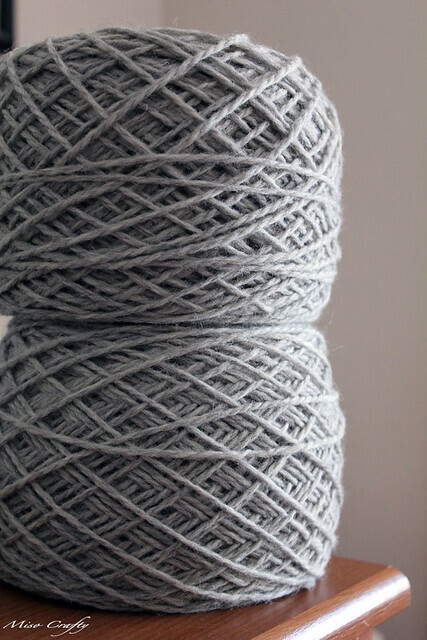 We talked about yarns and had set a date. Then life and summer plans got in the way. Hayley emailed me throughout the summer months and reassured me that she still wanted to do the KAL. I was sure we'd get around to it too eventually and assured her back that I wasn't in a hurry to get going and to not worry about it. I had a ton of other things on the needles, so a later start date was fine by me. Then the summer days dwindled down and Hayley returned to the weekly knit nights (yay!). We talked about the KAL again, but made no definite plans. Then one chilly day I was rummaging around my wardrobe trying to find a big comfy sweater that I could pull on and be cozy warm in all day. Brett and I had a bunch of errands to do that day but really, all I wanted to do was curl up on the couch with a million blankets wrapped around me and spoon an entire carton of ice cream into the hole in my face. I felt bloated and there was nothing in my closet that I wanted to wear. I had spotted my Hooters! sweater and wished that it wasn't so form-fitting and vowed right then and there that I was going to knit a big, comfy, and roomy sweater that did not accentuate every single curve and bulge (that you think you have all over when you're having a "fat day"). Later that day when I had the down time I checked out Ravelry for possible sweater candidates but kept coming back to the Owls pattern. Well, if I kept going back to it, then obviously that's what I'm looking for, right? I wanted quick and easy, and Owls was definitely quick and easy. It's a done deal. I skimmed the pattern and went over my project page. This pattern was technically my first sweater that I had ever knit. Ok, let me clarify. 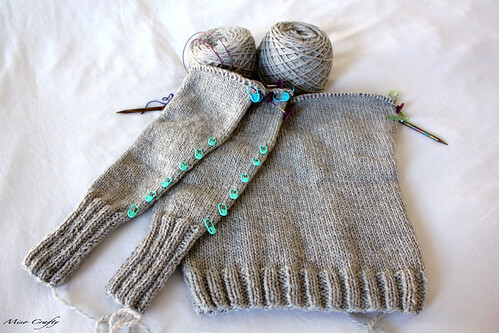 I had knit the pieces of sweaters before but had never completed those projects. The Owls, on the other hand, was a sweater that I had knit and had actually finished. It took me a weekend to knit, and back then I had no clue what I was doing. That's how easy this pattern is. Then it hit me. Hayley had queued this pattern too. She's even mentioned the colour that she wanted her sweater to be in before too. She can totally knit this. I emailed Hayley pronto. She was totally down and a week later had even bought the yarn. We didn't even discuss a start date cause the day after she bought the yarn Hayley had already knit her swatch! Boring photo, yes. But kinda obligatory in showing that there is indeed, a WIP! So here we are, almost two weeks from when we started our little KAL. So far we've got the body to the armpits done, and I don't know about Hayley but I managed to whip both sleeves over the weekend and am ready to join the whole she-bang to make this project look like an actual sweater. I didn't want to power through the pattern and put any unnecessary pressure on Hayley and make her think she has to knit like a speed demon, so each week we've agreed to knit to certain sections. Last Friday's agreement was that we'd knit to the section where we'd be ready to start to Owls action. I reckon that by next week I'll have a finished sweater to show you guys. I loved reading this post because I could totally relate to the longing for a comfy/roomy pullover. I am a cardigan girl but as soon as the chill arrived I have been seriously wanting a comfy pullover... I am working on one right now and I feel like once it's done I will wear it every day! I am so excited that I was mentioned in your blog, I feel like a celebrity now... hahahaha! I'm definitely a cardigan girl too, but this chill is screaming for pullovers! I'm waiting for yarn to arrive so that I can knit another comfy pullover...I have a feeling this fall/winter I'll be living in these 2 sweaters!